Josh DeWolfe. Everything video games. Upon reading the title of this article, I would imagine that most people would be somewhat confused as to it's meaning, but with luck, they would also be intrigued. The names themselves actually go a long way to speak to the spirit of their contents, but now I am getting ahead of myself. What I will be discussing here today are two indie games, spawned from the minds of Zeboyd Games. Both are available on Steam as well as Xbox Live for the ridiculously low price of $3. In fact I was personally able to grab them both bundled together for $3 on Steam - a deal that may not still be available, but truth be told, part of me wishes I had reason to give these folks more money anyways. The games are very similar mechanically, with Breath of Death VII: The Beginning being released on April 22, 2010 and Cthulhu Saves the World falling on December 10th of the same year. What in the world could these Ephemeral Titles contain however? Well gentle reader, read on to find out. As I mentioned previously, these games share a lot of common elements. Being similar games by the same developer, this is not surprising, nor is it really a bad thing. That said however, I'll start off by talking about what these games have in common, before talking a bit about each game individually in more detail. Both games are on the surface, very classic style turn based RPGs. In fact within 5 minutes of playing Breath of Death, anyone who has played the NES Dragon Quest titles will probably be feeling massive amounts of nostalgia. The battle system and graphics are very reminiscent of said games, though in Cthulhu saves the world the graphics have been bumped up considerably, but I'm getting off topic already. So the concept for both of these games is to have an oldschool feeling RPG that contains a surprising amount of fresh ideas that give a more modern spin on the game. Beyond even all that gameplay stuff however, the wit and humor in these games makes itself apparent from the get go. As you might expect from games with titles such as these, they are very much light hearted titles that don't take themselves too seriously, and are full of parodies and references. Anyone who has been playing RPGs as long as I have is sure to have a good laugh at the attitude in these games, and it's honestly enough to carry even a mediocre game. Or maybe I'm just a sucker for such things. I do love my video game references. There is much more to these games than some witty dialogue though. 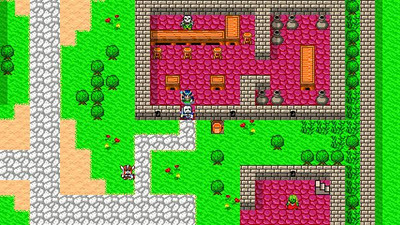 While on it's surface the gameplay is very similar to those 8-bit RPGs of yore, they do a lot of things to make the game more appealing. Iit quickly becomes very apparent that some real thought was put into the flow of this game, and there are some things here that even triple-A titles could learn from. Probably the first that you will really notice is that upon leveling up, you are presented with two options that allow you to shape your character in a number of different ways. Often times you will choose between different sets of stats, different spells, or sometimes even between different versions of the same spell. Granted as there are only 2 options per level, and your previous choices don't effect what choices you make down the road, the system isn't as deep as it could be. The fact remains however, it's perfectly possible to take a character and develop them as a caster, a damage dealer, a support character, whatever. I love character customization like this, and in the end of the day it's done here better than a lot of games out there. By the end of either game, I really wondered how it would work out had I built my characters differently, and I'm quite sure I will end up playing through the games again in the future and answering that question. I mentioned earlier however how the devs obviously put a lot of thought into the game's flow, so I should probably talk about that as well! See a lot of what makes this game attractive when you are actually playing it, is that the whole game is surprisingly fast paced. Battles are lightning fast, and everything proceeds literally as fast as you can hit the confirm button. There is no fiddling with healing items, as your HP is returned to full after each battle. You only regain a small amount of MP each battle though, and this amount is determined by how many turns combat lasted, fewer turns means more MP. As if that wasn't enough motivation to end things quickly, every round of combat the enemies get 10% stronger, making things much more dangerous the longer fights go on; Particularly nasty in boss fights. However there is also a mechanic to help combat that - namely combos. In the corner of the screen is a combo counter. It increments every time your party does an offensive action, with some abilities being multiple hits and thus incrementing the counter multiple times. Likewise there are other abilities which will deal damage based on how high the combo is, and reset the counter. Ultimately all of this comes together to make a combat system that is extremely fast, not at all intrusive, and kind of gets the blood pumping a little bit, despite being so similar to the original turn based combat. 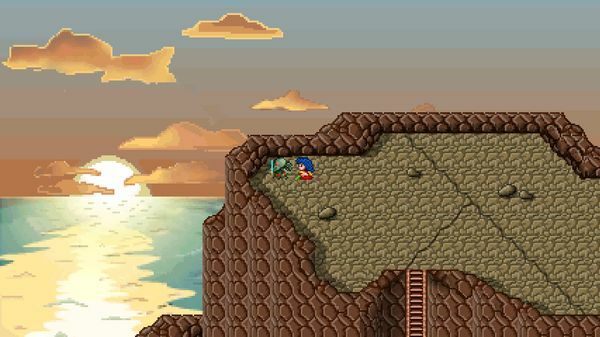 Pacing is really something that makes you want to keep playing these games, and it isn't restricted to just the battle system either. The music in both games is fairly simple, but surprisingly good. For the most part it isn't anything that I would want to put on my playlist (with a few exceptions) but they are quite catchy and do their job very well. Combined with the fast battles and the way your characters zoom about with dash turned on, I always felt like I just wanted to keep going. There isn't ever really anything breaking up the action, either. Restoration points are well spaced out, and even if you manage to get lost in a dungeon, there is a system wherein after fighting X amount of battles in a certain area, you will stop getting random battles in that area. Of course you could always use the "fight" command from the party menu to force a random battle, but there is rarely ever a need. Grinding is not something that seems necessary in this game, at least not on normal difficulty. Yea, there are different difficulty modes, but I'll get into that later. Now that about covers the systems in common, so now I shall begin talking about each game specifically in turn beginning with Breath of Death VII: The Beginning. The concept of this game is there was some sort of nuclear war, and everyone died. No worries though, the undead would soon re-colonize everything. Now everyone lives in a conveniently medieval world inhabited by various undead creatures. However there was some evil lurking (clearly not the undead folks, I mean not all undead are evil) and so a skeleton hero by the name of DEM decides to go save the day. What exactly that entails is more or less made up on the way. Now because this was the first game released, it more or less shaped the system used in the second, and so there isn't a whole lot to say about it that hasn't already been said. What I can say however is that the game is on the whole, a little bit easy. Also, in areas with multiple screens, the battles are segmented so that they get harder as you progress more screens in. You can never see those harder battles though if you use up your battles in the earlier screens. This makes that dungeon easier, but also screws up your EXP curve a little bit. Additionally, the character customization only persists until level 30, at which point both options become the same every level, which is rather lame. I do however really love how they designed the dungeons by making subtle mazes out of random objects like those you would find in the remains of a ruined city, rather than just making a maze out of walls. Now, on to Cthulhu saves the world. Zeboyd made some pretty major improvements to their engine for this game, and in a lot of ways it shows. The graphics are a big step up (for what that's worth) and there are a lot more things they can do. The story here is that Cthulhu, being the big evil creature he is, was about to do evil things when a mysterious hero drains all of his powers. 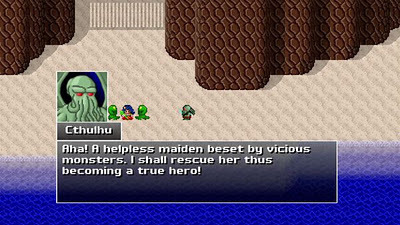 The only way to regain them is by becoming a true hero, and hence, the evil lord Cthulhu sets about doing good deeds. 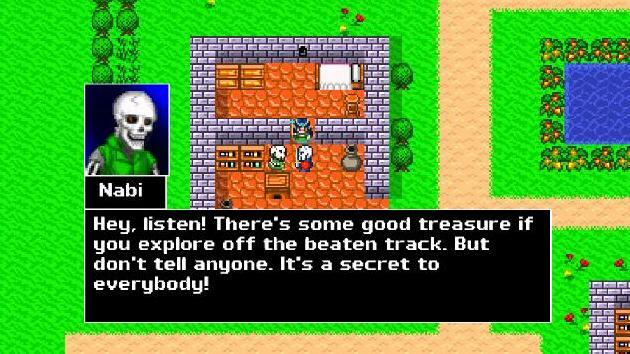 This paves the way for some very amusing dialogue, which is actually very reminiscent of games like Disgaea. The gameplay is a lot deeper in this game, as you have a group of 7 characters to assemble your 4-man battle team from. What's more, the equipment often comes with interesting secondary effects that let you further customize your characters. That said, it also feels noticeably more difficult, and I found myself dead pretty frequently in the first couple hours of the game. Not that it matters much if you save as obsessively as I do. Lawl I died, guess I lose 40 seconds of progress! On the whole it's clearly a better game. It does adopt a few more niggling problems, but nothing that's more than a minor nuisance, and most/all of the issues from the first game are things of the past. Now finally the last thing I wanted to mention was the replayability in these titles. I already mentioned earlier how I felt compelled to play through again to try out different builds, but there is also additional incentives to do so. Both games come with an easy, normal and hard mode, and so if you played on normal like most people likely did, you are always able to replay on hard. There is also a score attack mode in which you gain points for fighting bosses while underleveled. Cthulhu saves the world is particularly impressive however. See, after the game's initial release, an additional version was developed for both platforms, entitled "Cthulhu Saves the World: Super Hyper Enhanced Championship Edition Alpha Diamond DX Plys Alpha FES HD - Premium Enhanced Game of the Year Collector's Edition". It includes not only an insane difficulty, but also new games modes Highlander, Overkill and Cthulhu's Angels. Highlander lets you play through with a single character and insanely high EXP aquisition rate, Overkill levels you up to level 40 after one battle, and Cthulhu's Angels replaces the entire cast with female characters, offering very different dialogue and what have you. Consider the fact that it took me 5 hours to beat the first game, and 7 hours to beat the second. That is a lot of replayability for $3 titles. If you take anything away from this article, it's that both of these games are great fun for an even better price. They are fun games that make me laugh, make me smile, and make me yearn for a modern turn based RPG that is actually good. Honestly, it's been years since one came out. If you are a fan of oldschool JRPGs, witty references, a humorous cast of characters and fun in general, I can heartily recommend you pick up both titles. Seriously, go do it. Maybe if you give Zeboyd all your money, they will make another game! Breath of Death VII: The Beginning can be found here. Cthulhu Saves the World can be found here. Both of them can be found packaged here.